Today I have a very unique nail polish for review. 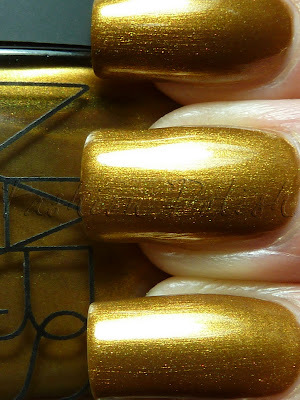 Nars Desperado, described as an "antique brass" is a truly deep, rich, antique gold with a hint of green. I'm pretty sure it's not a shade that would win everybody's heart but I've never seen a nail polish like this one so I definitely had to have it! Again, the formula was flawless, it applied itself in two high shine, quick drying coats but a third one brought up all the shimmer perfection and depth. Again, I'm not sure everybody will like Desperado but I must say that I'm impressed with Nars for releasing such an unusual and complex shade. it's a really great color ! but I'm not sure it would go with my skin tone. it's BEAUTIFUL. I really loved it and I think it would work perfectly with all light and mid skin tones, but I'm not sure if it will with dark skin tones. I love it! Fabulous swatches! I'm inspired to go through my collection for like colors. Thank you for sharing. This is really beautiful colour :-) Love it. I love the color! It looks amazing!